MINNEAPOLIS (AP) — Prosecutors on Monday charged a Minneapolis area man with a felony for allegedly pulling a gun on a group of young Somalis inside a McDonald’s last month. 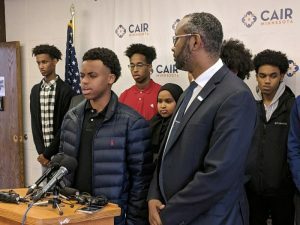 One of the teens at the restaurant told reporters Monday that he and others feared for their lives, Minnesota Public Radio News reported . According to the complaint, two young women told police they were trying to pay for their food with a digital app at the fast-food restaurant in Eden Prairie on Nov. 19, but it was not working. Johnson was behind them and allegedly said “you were probably trying to pay with EBT,” an electronic benefit transfer card used to transfer federal government benefits to stores. Investigators got short clips of the confrontation from cellphones, but it took a week to obtain the store video, Freeman’s office said.